Baker Christine Chapman of Bainbridge Island creates fanciful as well as fancy cakes in her home kitchen, the headquarters for a one-person business known as Crumbs Cakery. A few photos of her sculptured cakes designed on water themes are shown on this page. A native of Austria, Christine was trained as a construction engineer and spent the early part of her career working for architectural firms in Austria and Germany. She jokes that some of her more elaborate cakes, such as a 2.5-foot Lego Batman cake, require a bit of structural design. Christine’s life changed course when she met her future husband, an investor, at a wedding in Austria. They eventually moved to California for a short time before deciding to raise their family on Bainbridge Island, moving there in 2001. Her early cake-baking projects were done for her children, who loved cakes that looked like real objects, sometimes telling a story. For the most part, she is a self-taught baker. In 2012, Washington’s new Cottage Foods Law went into effect, allowing people to sell products made in home kitchens — provided the sales were direct to consumers. “I thought this would work, so in 2014 I started my official business with a website, and I started to get some cakes out there,” she said. Since then, she has made about 200 cakes — from collections of cupcakes to large wedding cakes to a variety of sculpted cakes. Through the years, she has studied cookbooks and taken a few classes, some online and some in person. “I’m still learning with every single cake,” she said, adding that she loves working with customers and leaning on her creativity to turn their ideas and color schemes into works of art. One or more sketches usually precedes the baking itself. 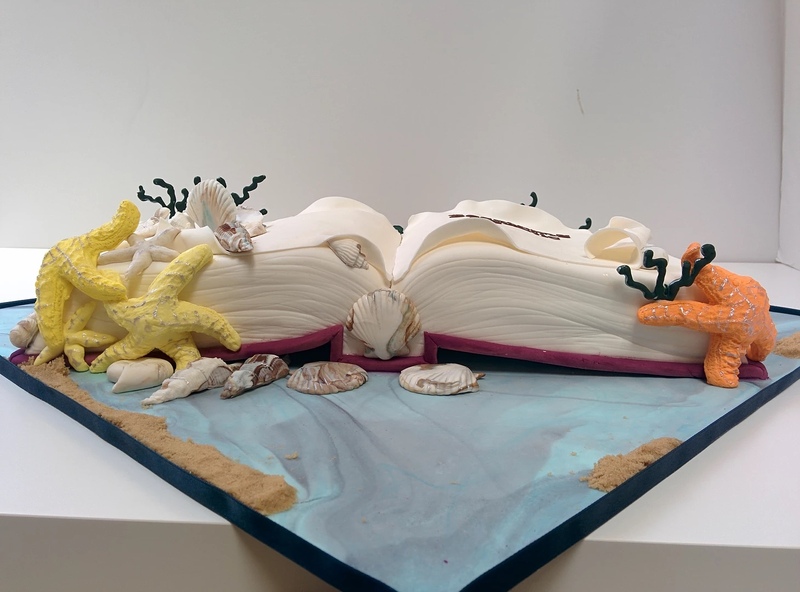 The first cake shown on this page combines a book with a variety of sea creatures. The cake was created for a young woman graduating from a creative-writing school, according to Christine. For her final thesis, the woman wrote about her relationship to marine life and tide pools. She titled the paper “Becoming Aquatic,” and that became the title for the cake. 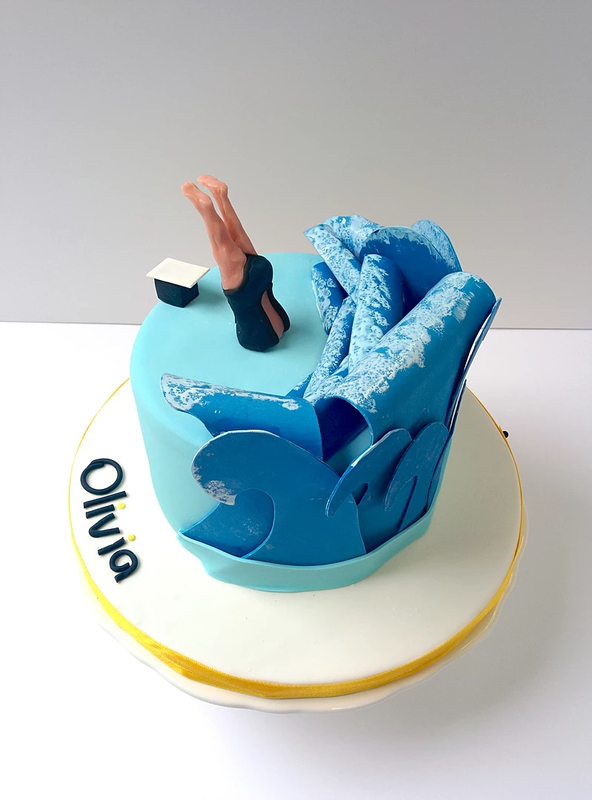 The second cake, “Swim Olivia,” was a birthday cake for a swimmer name Olivia who was involved in a swim team. Christine started with a photo of the person diving into the water. 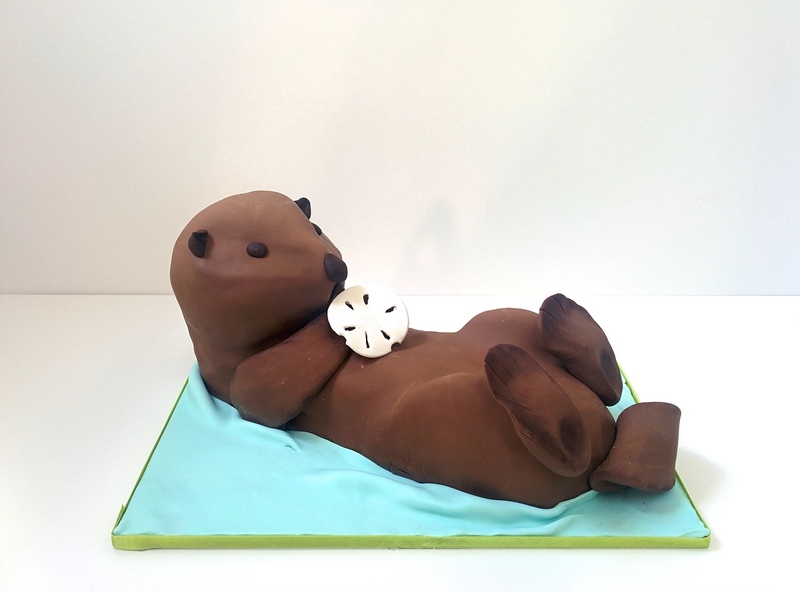 The otter cake is one of many similar cakes that Christine made through the years for fundraisers at Ordway Elementary School, which her children attended. 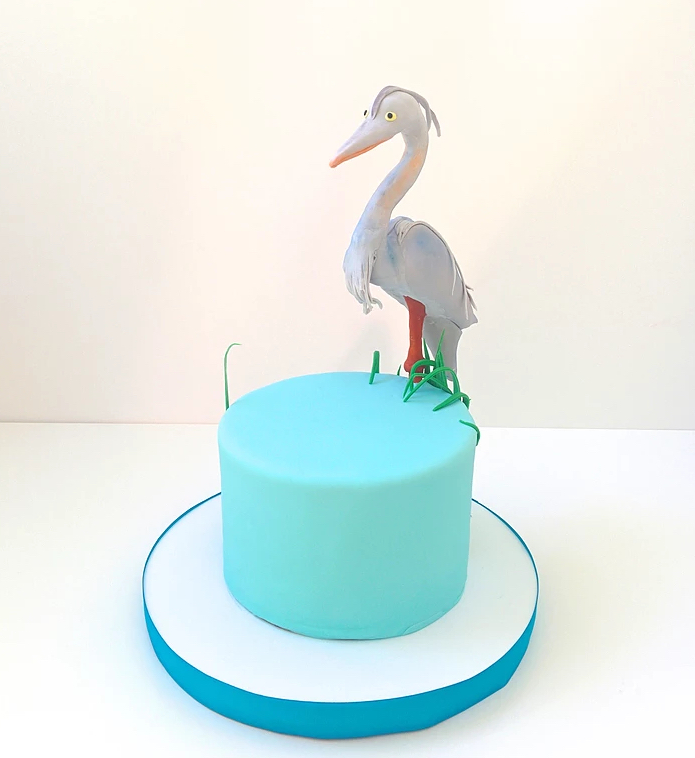 The great blue heron cake was made for a fundraiser for West Sound Wildlife Center. Christine says she is still having a lot of fun baking the cakes and intends to stay busy with the work. Other cakes she has made can be seen on her Gallery webpage, and she can be reached through her contact page.